Finally, the time has come to bid goodbye to the year 2017, which had its share of both pros and cons in immigration rules. To begin with, the changes in its occupation list removing, 200 occupations from its list on 19th April 2017, this was a big jolt to many aspirants. However, post this debacle Australian Immigration has not taken any drastic decision for the year 2017. The below data will give you insight into the number of visa’s approved for the year 2017 for different programs and also compare the Australian Immigration today with the year 2012 Immigration statistics. The above report gives us an insight towards the 2018 Australia immigration. 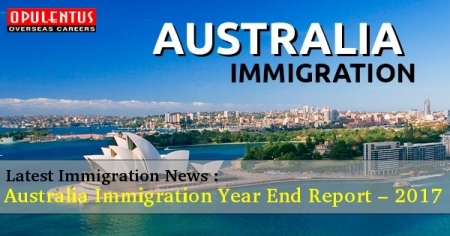 One can assure that next year is going to be positive in terms of immigration to Australia, and as the Australia immigration has had a shortfall of their visa approvals for the year 2017 we can expect more positive reforms to be made by the government. To find out if you are eligible please contact us through at [email protected] or call us 7207111222. One of our experts will meet your expectations and provide answers to queries.